A fragrance-free moisturising blend, rich in essential fatty acids, to help maintain the skin’s elasticity, prevent stretch marks and soothe the discomfort that can accompany expanding skin. 100% of the agricultural ingredients are produced organically. 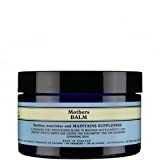 Mothers Balm comes in a large, stylish, blue glass jar. This entry was posted in Organic Health Products and tagged 120g, Baby, Balm, Mother, Mothers, Neal's, Remedies, Yard by Organic Health. Bookmark the permalink. Disclaimer: Organic Health UK is a participant in the Amazon Services LLC Associates Program, an affiliate advertising program designed to provide a means for sites to earn advertising fees by advertising and linking to Amazon.com/Amazon.co.uk. Copyright © 2019 Organic Health UK. All Rights Reserved.